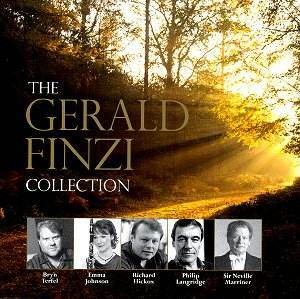 This double CD set is called with no false modesty 'The Finzi Collection'. It is more a case of A Finzi Collection including some good versions, some very good recordings and some that satisfy but are not of the very best. Any survey needs to be prefaced by a caveat. The Finzi discography is skewed by the continuing non-availability on CD of the pioneering recordings made by Lyrita during the period 1968-1979. No Yo-Yo Ma cello concerto, no Ian Partridge Intimations, no Handley In Terra Pax, no Carol Case, Jenkins or Tear in the songs, no Boult in the smaller pieces like Introit, Severn Rhapsody (now there's a piece unrecorded by anyone since!) and Nocturne, no Denman Clarinet Concerto, no Katin in the Eclogue. If these were reissued on CD they would in many, even most, cases change the roster of top recommendations. Unaccountably they remain locked away from us. Who knows how long this will continue. The present Decca set is a more open-handed anthology than the company�s previous 'British Music Collection' Finzi volume (468 807-2). This played across two discs for just over two hours. Langridge's Dies Natalis is very good with only an infrequent surrender by the tenor to a displeasing bleat e.g. at 2.20 on the word 'love'. Otherwise this is a touching and intelligently sung reading with the best ever orchestral contribution from the LSO and Hickox. Listen to 'The corn was orient and immortal wheat' where the LSO strings attain a rare and hushed enchantment. In The Wonder, "The skies in their magnificence" lacks lean intimate beauty. The ECO leader's sweetly discoursing solo in the classic EMI version (Christopher Finzi conducting) is matchless and the tenor, singing with ineffably pristine control and emotional response, is Wilfred Brown. Brown also unerringly accents this 'panting heart' in 'The salutation' where Langridge lets the opportunity fall. There are many many good things in Langridge�s version but you forget the EMI version at your peril. Piers Lane's lovingly done Eclogue, with oboist-turned-conductor, Nicholas Daniel, is taken a mite too fast fully to register its placid pastoral repose. The Forlana is one of the Five Bagatelles stylishly arranged for orchestra by Lawrence Ashmore. A pity we could not have had all five: the whole set has a heart-easing melodic content and a gleam in the eye. Even if Emma Johnson's clarinet is recorded very closely this is lovely playing. The Forlana paves the way for the Clarinet Concerto in which Andrew Marriner is partnered by his father Sir Neville as conductor. Their approach is relaxed and leisurely although Andrew�s clarinet tone is not as luxuriant as that of Johnson (who recorded the Concerto for ASV) or the late John Denman whose recording of the Concerto on Lyrita LP has never made it to CD. If the clarinet tends towards leanness the orchestral picture is rich - especially in the Adagio which is, after all, marked senza rigore. The Magnificat is not top drawer Finzi but, let's face it, when you have caught the bug you will want to chase down every one of the forty opus numbered works and beyond even if there are a very few disappointments along the way e.g. the desiccated Violin Concerto ('reborn' on Chandos - wonderful central Introit but woeful outer movements) or the song cycle, still unrecorded, By Footpath and Style. Such a pity that the St Cecilia Ode (it was on the Decca British Music collection set) or the whole of Lo the Full Final Sacrifice could not have been included. They were on the same 1978 Hickox/Argo LP as the Magnificat. By contrast In Terra Pax is prime Finzi. This Vaughan Williamsy Christmas cantata is snowily magical in the right hands. Parallel works include the much underrated RVW Oxford Elegy. Both Hickox (Decca) and Handley (Lyrita LP) are spot-on. David Hill is very good and he has a superbly controlled Donald Sweeney (we should hear more of him) and a bell-clear Libby Crabtree to complete the picture. The only blemish is that the powered string orchestra entry in part II ("Glory to God in the Highest") lacks the punch delivered by Handley and Hickox. Both the Romance and the Nocturne plough the turbulent sea of song already explored in Dies Natalis and in the Clarinet Concerto. There is a deeply satisfying heart-comforting quality to Finzi's invention that Bridges from Elgar and, before Elgar, from Dvoř�k and his Serenade for Strings; even from Tchaikovsky's Serenade. The Romance is for strings; the Nocturne for full orchestra although the strings always carry the burden. The Nocturne has a symphonic mien which is not best captured by Marriner. This is better felt in the guiding hands of Boult (Lyrita LP) and Hickox (EMI). Earth and Air and Rain has Benjamin Luxon, in stalwart and largely unwavering voice and with poetic intelligence fully engaged. His admirably pliant delivery is memorable without quite matching the staunch John Carol Case on a Lyrita LP. He is however stronger than his counterpart on the Hyperion Finzi/Hardy double set. When Luxon sings "lost Lizbie Brown" the word "lost" is imbued with withering pain. The Clock of the Years, a scena around a Faustian time-travelling love story, is ultimately despairing in a typically Hardyian way. Luxon is fully in touch with this. David Willison accompanies with the same percipience and, where called for, ebullient spirit. Terfel in Let Us Garlands Bring relishes the cruel challenges of singing quietly. His voice shows remarkable steadiness. Word production is precise without pedantry. He takes Come Away and Fear No More as slowly as I can recall them being taken by anyone. Allowing for the lightest Cambrian burr in his voice he recalls the voice of John Carol Case the past glory of which is barely hinted at in Lyrita's recording of the orchestral version of Let Us Garlands Bring. Terfel acts the words - just listen to the colouration and inflection he uses for the words: 'between the acres of the rye.' And when he sings "youth's a stuff will not endure" it is done in a confiding fearful whisper. Martineau colours and spins the piano line to empathic perfection. In the last line he �ding-a-ding-dings� with the very best. Raymond McGill's notes lay out the essential facts of Finzi's life with economy and precision. Homer nods only once when we are told that Finzi set poems by Robert Hardy. I am sure that the actor would have been flattered but Thomas Hardy is the correct reference. None of the sung words are printed. Everything here in this set is at least acceptably played and recorded. The songs are much much more than that. Dies Natalis and In Terra Pax are very good indeed. The rest is enjoyable. Overall the set makes a wonderful present for anyone who has had their attention caught by a single Finzi piece and wants to explore further. Beyond this set I recommend the Cello Concerto (Tim Hugh on Naxos) and Matthew Best's Hyperion recording of the Intimations of Immortality. Go forth and purchase.